Compose a portrait of your family! Three generations of family members in large, easy-to-use plastic stencils. Arrange the stencils on a large sheet of paper and trace them. Lay the specially designed rubbing plate underneath the paper and rub one of the patterns on to the paper to create unique clothing designs. Mix and match designs. Add facial features, hair and clothing details. 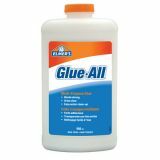 Up to 4-3/4" x 10-1/2". Includes an idea guide, 9 stencils and 2 rubbing plates. Ages 4+. 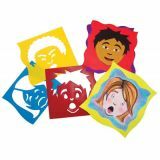 Detailed stencils for tracing & painting. Easy-to-clean. Edges of the stencils can be incorporated into animal art. Up to 7-3/4" x 7-3/4". Idea guide. 10/pkg. 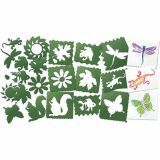 Use these multi-purpose stencils for a wide range of art and craft projects. Start by popping out the interior shapes. Use these shapes as templates. 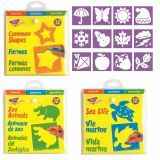 The stencils come in three different challenge levels: the square stencils are the easiest to trace and represent basic shapes; the rounded stencils progress to slightly more complicated shapes; the slanted stencils are the most challenging. Let children work at the appropriate level for their developmental needs. 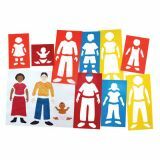 Once comfortable with the stencils, use the templates to challenge the students! Includes teacher guide with art activity suggestions. 27 stencils. Ages 4+. Jumbo snowflake stencils in 12 shapes. Make bulletin board decorations, wall borders or hang ceiling art! 8" x 8". Ages 4+.